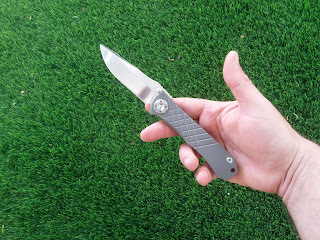 Best Chinese Knives: Wild Boar Umnumzaan Clone - Not Recommended! Wild Boar Umnumzaan Clone - Not Recommended! I bought this one, because I wanted to try the design, to see the quality levels of the older clones and compare those to the newer ones. Well, I can say that this knife is definitely not recommended for purchase, mainly because of the many different issues with tolerances, fit and finish - the action out of the box is very bad, it had blade play to both directions and occasional lock stick, mirror finish and the grind on the blade are done poorly and the grind is very thick, almost to the point that it doesn't cut. I have managed to improve it a bit by polishing the washers and tweaking the pivot, but most issues weren't gone and it still had problems with the action and lockup. So, from one side I'm pretty upset about the quality of this knife, from the other side, I'm impressed by the huge leap the Chinese made in their knife making, because the newer clones and other knives are done much better and most of them don't have issues on that level. It has milled bead blasted ti handles (it's best quality), allegedly D2 blade (don't think it really is, seems more like something in the 440 range), bronze washers, oversized proprietary pivot (constantly unscrews), and big ceramic detent ball, which also is the contact point between the framelock and the blade.